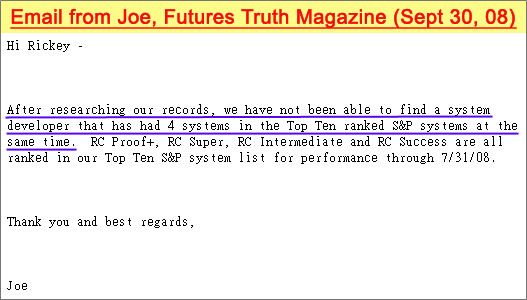 At Jan 28, 2011, RC decided to stop tracking all RC systems in Futures Truth Magazine (Y2010 issue 4, just come out and RC Beginner still ranks No. 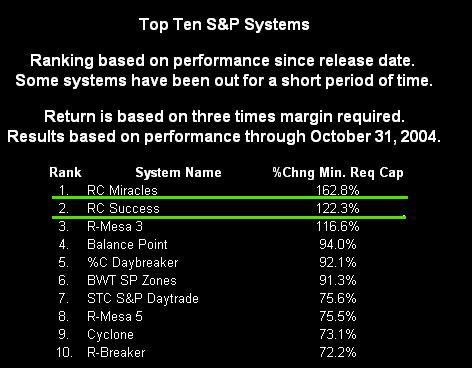 1 in Top 10 S&P Day Trade Systems). 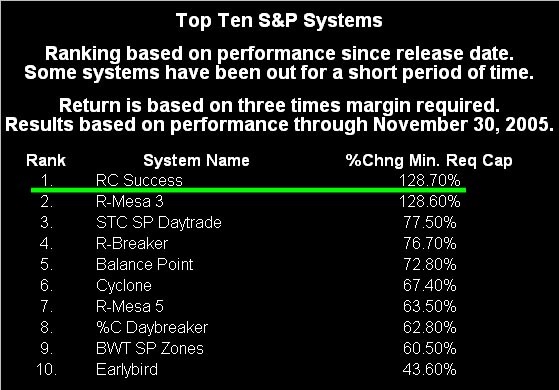 Reason to stop is RC had already set many records as a system developer. It's time to climb higher mountain. 1) RC starts sending systems to Futures Truth on April 2004. 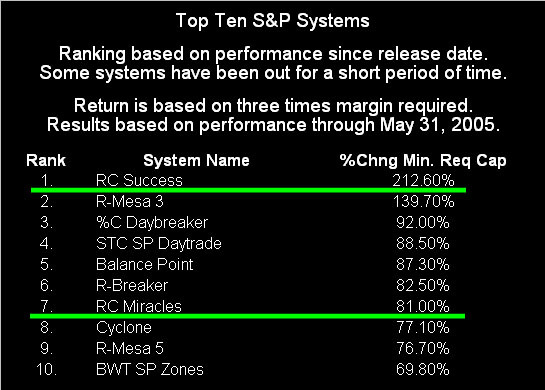 Futures Truth had 33 copy issues since then (please see below), and RC systems had ranked No.1 for 18 times (more than 55%) within past six & half years. 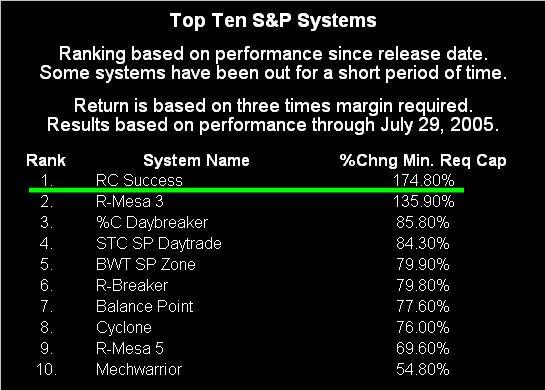 2) RC is the only Asian system developer ever made No. 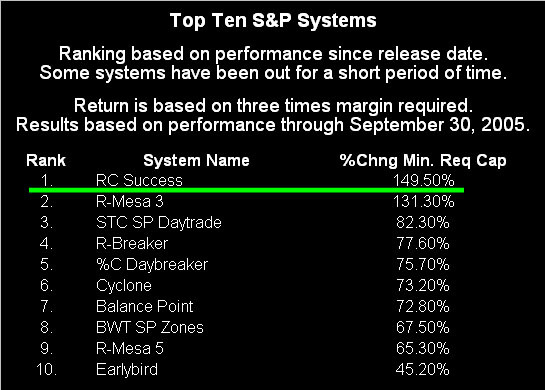 1 ranking in Day Trade S&P System (and it's 18 times) and several times Day Trade Systems. 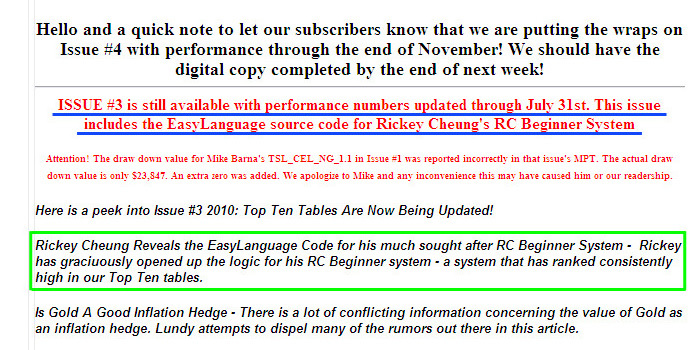 3) RC had reviewed all the logic, strategies and source code of RC Beginner (No. 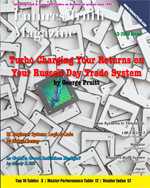 1 system) in Futures Truth Y2010, issue 3. This system still ranks No. 1 in the Y2010 issue 4. 4) Please remember, backtest result is no indication of future performance. 5) RC decided to focus in other new challenges, climb higher mountain. Mostly in advising and coaching traders and hope one day, more Asian system developers will be known and can break his record, though it may take many years to achieve. 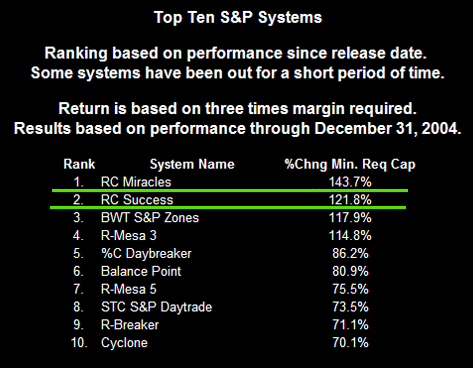 6) RC would like to thank all those who had support RC and his systems in past years. 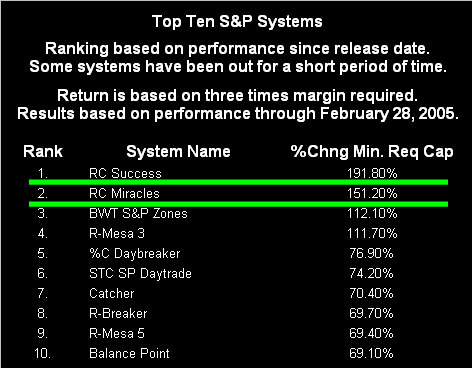 RC Miracles has been replaced by RC Miracles 2 on March 2005. RC Miracles will stop tracked by FT and RC Miracles 2 will start publish by FT in coming issues. 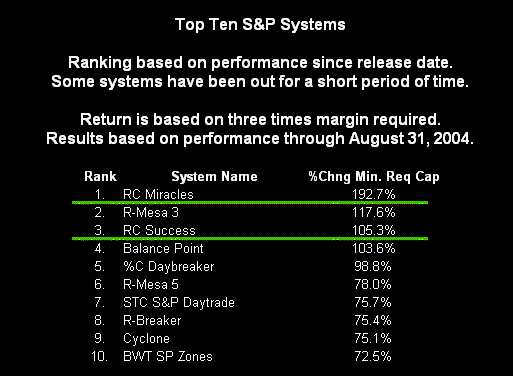 "Rickey Cheung's DayTrade systems have ranked number one several times in our Top Ten Lists. 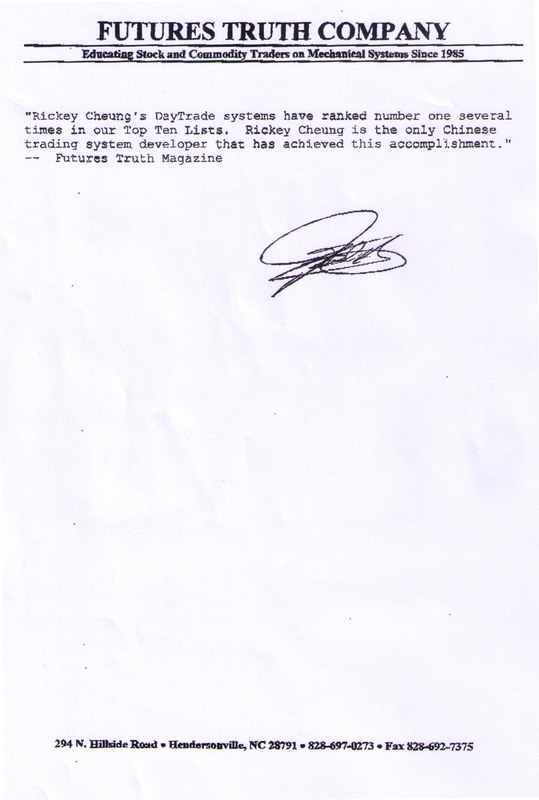 Rickey Cheung is the only Chinese trading system developer that has achieved this accomplishment." Futures Truth has looked at your model for trading the SP's. Trade Station performance showed very excellent returns during the test period of around 3 years. Profitable trades were 66.9%, net profit of $39,062, and max drawdown of only $2,100. This is by trading one mini SP per signal. The indicator used in your logic is very unusual and I have not seen any systems that use similar indicator's. I congratulate you on developing a very excellent system. Our objective is to track the record of RC Systems for years to come. No intention for any Sales or Marketing purposes.